A recent study finds that 70% of mobile searches lead to online action within one hour. Put your mobile app marketing aside for a second and let this sink in. 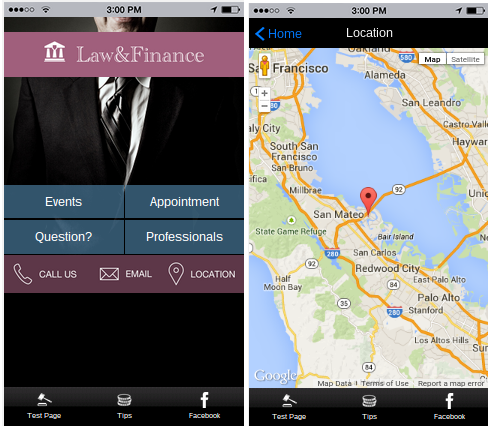 If a potential customer finds your mobile app through their mobile search, what is their next move? Shall you use Constant Contact form in your app to let them get in touch with you? One of the most effective ways to bring in more sales leads is to create and build an email list using Constant Contact. Many companies include Constant Contact email subscription form on their websites or even place an iPad kiosk at a register for customers to punch in their own information while checking out. Where does this leave you with your mobile app? 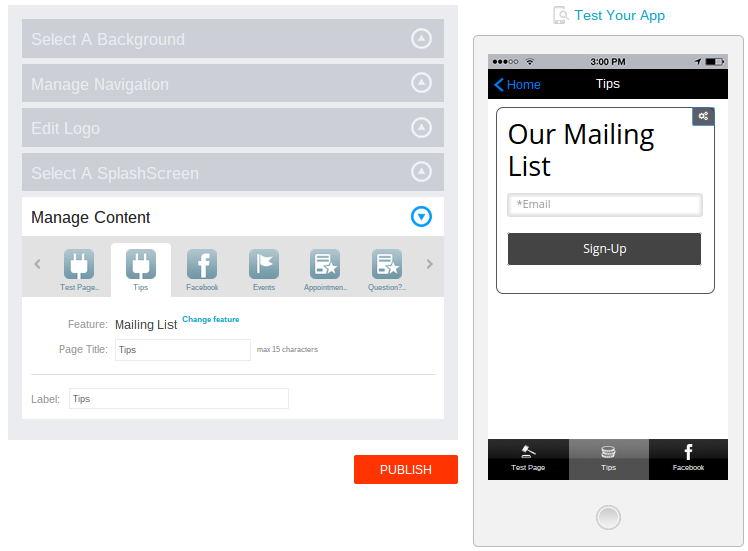 Luckily, iBuildApp has some quality features for posting Constant Contact email subscription form on your mobile app, reminding your users to sign up and receive additional content through email. You can even cross-promote your emails and mobile app by sending out newsletters that tell people to open up the mobile app to retrieve coupons and promotions. To add this feature on iBuildApp, go to the Manage Content area in your mobile app design section. Click on the Change Feature link and choose the Mailing List option under POWr. It’s wise to include Constant Contact subscription form on several pages of your mobile app, so people are constantly reminded, but don’t overwhelm them by cluttering your content. Personal communication channels display to your customers that you show an interest in helping them find what they want. A support page and contact information works well, but what if a user is more prone to contact companies through Facebook or Twitter? It doesn’t matter if you only have a few hundred followers on these channels, because you are making life easier for a selection of your more loyal users. 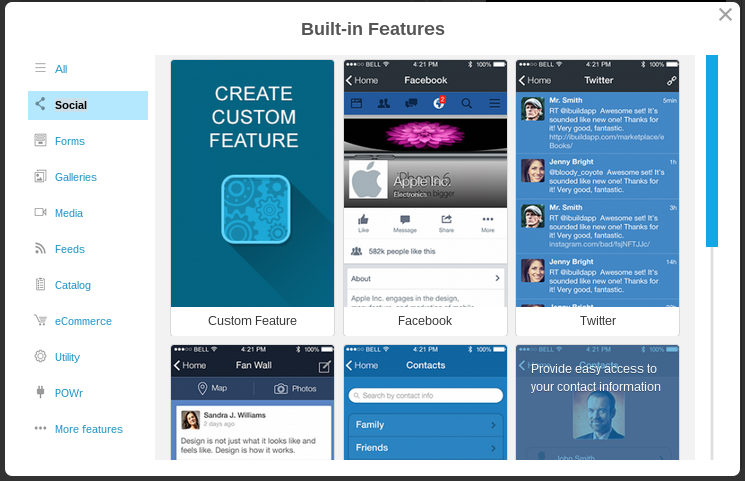 When building your mobile app you have various social features to choose from, including a Facebook or Twitter feed, social buttons and a fan wall. Encourage customers to share your pages to help out other people as well. Just make sure you engage with anyone who contacts you through social media to improve your conversions. No one likes to be sold to, and the same goes for your mobile app users. Buying from a person is always more satisfying than purchasing from a faceless company that doesn’t seem to care about its customers. That’s why it’s important to focus on components in your mobile app that reveal the person behind the magic. Even if you run a business with multiple individuals, choose a person as the face of your company. Develop testimonial pages, include employee photos, provide a personal-sounding About page and work on every chance you have to make an emotional connection with users. A live chat module isn’t all that practical on a mobile app, so you’re tasked with giving your customers quick contact forms and buttons so they get their questions answered quickly. Quick contact buttons are the heart of improving business leads with your mobile app, since one of the main reasons people will visit your app is to simply call about a reservation or email you to book an appointment. This is all available in the iBuildApp features area, but remember to clear out the clutter on your homepage, so users know exactly where to click for support. 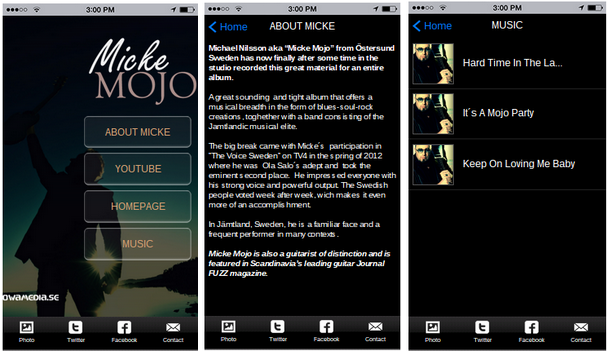 Customers dig exclusive content, and a mobile app is the perfect way to give it to them. Rewards programs and social media promotions are a nice way to generate an exclusive environment, but what about those truly loyal customers who want the inside scoop on everything from product releases to special promotions? Tell them to download your mobile app, and send out push notifications when exclusive content is sent out. This is all completed in the Notifications area of iBuildApp, and you can send people to new blog posts, coupons, product releases, events and more. If you’re ready to take your business into the mobile era, check out everything iBuildApp has to offer. If you can think of some other cool techniques to get more leads on mobile apps, drop them in the comments section below.